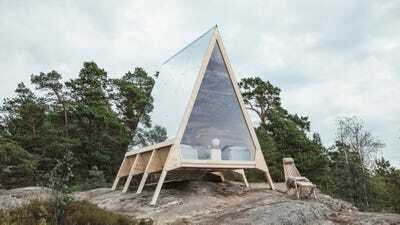 A new cabin prototype in Finland is letting people book a beautiful getaway just outside the country’s capital. The cabin, which is roughly the size of a small bedroom, will remain on the island until the end of September. It can be assembled and moved without heavy machinery, and its energy supply is fully renewable, with solar panels generating electricity and renewable diesel fuelling the stove. WiFi and running water are not available in the cabin. Guests can access “ecological dry toilets” about 440 yards away, and fresh water is available for free at a port about 765 yards away. An Airbnb listing reminds guests to be mindful of the animals that live on Vallisaari island, including badgers, swans, and bats. “With the Nolla cabin, we want to offer visitors the possibility to experience modern cabin life in the realm of nature, with minimal emissions,” Finnish designer Robin Falck, who made the cabin, said in a press release. Nolla’s first visitors will arrive in August: Otso Sillanaukee, who has written a guide on sustainable living, will spend a weekend at the cabin with several Finnish social media influencers. In September, the cabin will be available for booking through Airbnb for a two-night stay. The listing says the cabin will cost $US35 per night. Sirpa Tuomi, Neste’s marketing director, said Finns are known for spending time at their summer homes, adding that Falck’s design could be adapted to any other cabin.